Number 3 of 5 is this unique design pen dedicated to the breathtaking Temple of Artemis at Ephesus! Artemis, daughter of Zeus and Leto, was the goddess of wilderness, and in turn wild animals and hunt. She was also goddess of virginity and childbirth and protector of young ladies. Her vital role in society made her one of Greece’s most venerated deities, together with Apollo, Zeus, and Ares. This widely spread cult and admiration lead to the construction of the largest temple in ancient Greece, and no doubt the most beautiful. Antipater of Sidon said of this monument: “Lo, apart from Olympus, the Sun never looked on aught so grand”. Although there was an older temple in the same site, the well known temple of Artemis was according to Pliny, 377 feet long and 180 feet long and was built in 550 B.C. The temple was made entirely of marble and was surrounded by 60-foot high columns. As we know, columns are one of the most distinct features of Greek architecture and have inspired other constructions in Roman, Christian or Muslim culture. The temple had many rows of columns which held the structure and divided the temple in different sections. The inside sheltered a large statue of the goddess for cult and ceremonies, as well as many other smaller statues. This wonder was so famous in its time that people came from all around the Hellenic world to visit it and present their offerings to the goddess. The temple was destroyed in 365 B.C. and legend has it that it was the same night Alexander the Great was born! Of the Seven Wonders of the World, this is the only one that wasn’t destroyed by an earthquake. The author was Herostratus. In an act he hoped would give him fame throughout the centuries, he set fire to the roof of the temple and managed to destroy it! The temple was rebuilt and was used for many years until it was finally raided and destroyed by the Goths in 268 A.D. Most of the material was used to build later constructions, and today all you can see are some ruins! Pelikan’s limited edition fountain pen has a very unique design in the form of a Ionic column. It was released in 2006 after the Colossus of Rhodes and Pyramids of Giza editions. The large dimensions of the pen (6.25″ long) were chosen to resemble the huge proportions of the temple, and the fine metals (platinum and gold) the pen is made of are similar to the precious offerings the goddess received. Removing the cap, which is half as long as the pen itself, reveals an engraved image of Artemis. 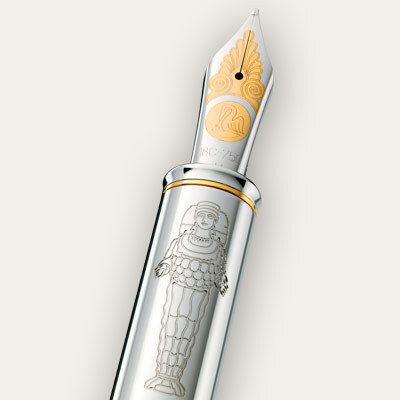 The bottom of the pen has floral decorations, which remind the goddess’s relation with nature and fertility. This pen is sure to leave you dazzled at first sight, since it’s almost impossible to find anything like it!